What is Levothyroxine - Generic to Soloxine? Levothyroxine is the active ingredient found in Thyro-Tabs, Soloxine, and Levocrine. Levothyroxine is a medication prescribed for dogs and cats to treat conditions associated with hypothyroidism. This medication can be used in cats in those instances where the thyroid gland has been surgically removed. Levothyroxine requires a prescription and is sold per tablet. 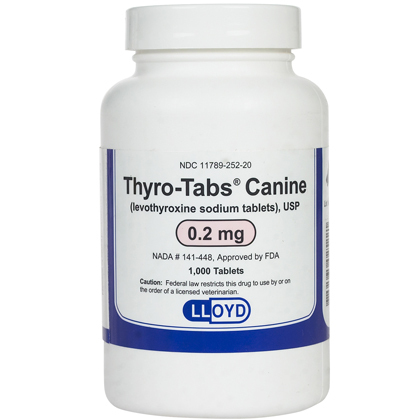 Levothyroxine provides thyroid replacement therapy to pets with hypothyroidism or other thyroid conditions due to low circulating thyroid hormone. Keep out of reach of children. Administer with caution to animals with primary hypertension, euthyroidism and clinically diagnosed heart disease. What is the most important information I should know about Levothyroxine? Levothyroxine is FDA approved for use in dogs only; however, it is a commonly accepted practice to use Levothyroxine in cats as well. Levothyroxine is available by prescription as 0.1 mg, 0.2 mg, 0.3 mg, 0.4 mg, 0.5 mg, 0.6 mg, 0.7 mg, 0.8 mg, and 1 mg tablets. The usual dose in dogs is 0.1 mg per 10 pounds. The usual dose in cats is 0.05 mg to 0.1 mg per cat. The dose of Levothyroxine may require adjustment based on periodic blood tests to determine your pet's T4 level. There are many medications that can affect Levothyroxine. Tell your veterinarian about all the prescription and over-the-counter medications you give your pet, including vitamins, minerals, herbal products, and drugs prescribed by other veterinarians. Levothyroxine will, most likely, be needed for the rest of your pet's life. Long term use of Levothyroxine may cause osteoporosis (bone loss). How should Levothyroxine be given? Give Levothyroxine exactly as directed by your veterinarian. Do not give this medication in larger amounts or for longer than recommended by your veterinarian. Follow the directions on the prescription label. If you do not understand these directions, ask your pharmacist or veterinarian to explain them to you. What happens if I miss giving a dose of Levothyroxine? Give the missed dose as soon as you remember. However, if it is almost time for the next regularly scheduled dose, skip the missed dose and give the next one as directed. Do not give a double dose of this medication. What happens if I overdose my pet on Levothyroxine? Seek emergency veterinary medical attention if you feel an overdose was given. If given at the proper dose based on blood tests there should be no side effects. Symptoms of Levothyroxine overdose may include dizziness and fainting, increased thirst, urination and hunger, and panting. What should I avoid while giving Levothyroxine? Different brands of levothyroxine may not work the same. If the pills look different from the last filling, speak to your pharmacist or veterinarian. What are the possible side effects of Levothyroxine? If any of the following serious side effects occur, stop giving Levothyroxine and seek emergency veterinary medical attention: an allergic reaction (swelling of the lips, face, or tongue; difficulty breathing; closing of the throat; or hives). Call your veterinarian if your pet develops any of these serious side effects: sleep problems; personality changes; fever; appetite changes, weight changes. Less serious side effects may be more likely to occur. Discontinue use if your pet experiences: cough; loss of appetite; dizziness, drowsiness; sleep problems; dry mouth; nausea, vomiting, diarrhea; itching or rash. Side effects other than those listed here may also occur. Talk to your veterinarian about any side effect that seems unusual or bothersome to your pet. What other drugs will affect Levothyroxine? Tell your veterinarian if your pet is being given an antidepressant. Talk to your veterinarian or pharmacist before giving any prescription or over-the-counter medications, including vitamins, minerals, and herbal products. Certain medications can be given with Levothyroxine, but they may make Levothyroxine less effective. If you give your pet: sucralfate (Carafate),or aluminum antacids (Maalox, Mylanta), use them 4 hours before or 4 hours after giving Levothyroxine. Levothyroxine is used to treat hypothyroidism or low thyroid hormone. Periodic blood tests are necessary to measure thyroid hormone levels. Allow plenty of water for the pet to drink. Levothyroxine may be given directly or placed in your pet's food. The usual dose is 0.05-0.1 mg per cat.